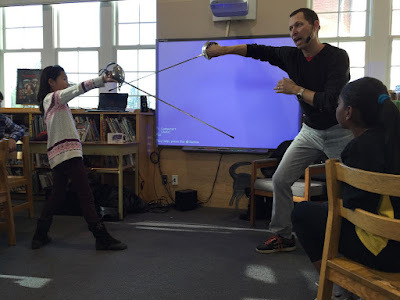 Yesterday I had a wonderful opportunity to visit with five classes of grades 6 and 7 students at Shaughnessy Elementary School in Vancouver, both to contextualize and read from Caravaggio: Signed in Blood, and to conduct a short fiction-editing workshop. Little known fact: as a high school student I delivered newspapers in the Shaughnessy neighbourhood kitty-corner from the elementary school, on the other side of Granville and the other side of King Edward. I hadn't had occasion to return to the neighbourhood until now. The students were keen writers, and during the workshop it was rewarding for me to see them catching some of the common weaknesses in their stories and make improvements to them. 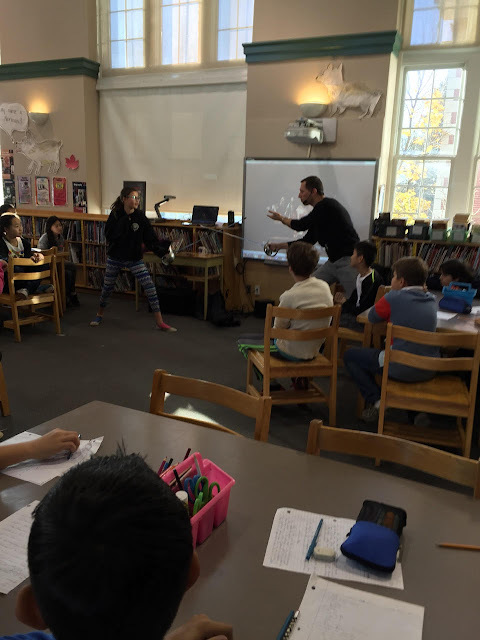 As the librarian, Ms. Hapton, said, the students had been taught many of these writing techniques in the past, but sometimes it just seems to "stick" more when it comes from a special guest. If so, I was happy to provide the glue. From the pictures below, you'd think all we did was play with swords. The cameras always seem to come out at this point in the presentation! WE WORKED ON WRITING! HONEST! And lest you think my size was an advantage in the little contest above, note how well the student is parrying. I never had a chance! If you'd be interested in having me visit your students, send me a message via the contact form in the right-hand sidebar and we can work out the details. I'm even available to conduct a Skype visit if your school is outside of Metro Vancouver.